For decades, we have taken a “just say no” approach to stop, prevent or blunt human encroachments onto the natural world – often rightly so. Early environmentalism needed lines in the sand against rampant development and reckless industrialization and achieved widespread success. Our air and water is now cleaner even with population and economic growth. Industry, for the most part, is now accountable for its wastes. Despite decades of earnest efforts and expenditures, human influence on the natural environment continues to grow, albeit at a slower rate. Native species continue to become endangered. Tens of thousands of inadequately tested chemicals still remain in use. Carbon exhausts keep accumulating and warming the planet. Our imprint on nature is subtler but more pervasive and difficult to stymie than we had ever imagined. In the Sacramento-San Joaquin Delta, more than 90 percent of plants and animals don’t belong there naturally. They have profoundly changed food webs and habitats, mostly to the detriment of native species. Invasive non-native species have been introduced for fishing or escaped from ship ballast water, anglers’ bait buckets or home aquariums. Such environmental changes are not subject to review, and answer to no court. Classical environmentalism is mostly about stopping new harmful human influences, not reversing the harmful effects of past changes or shaping a more environmentally friendly future. Environmentalism has not substantially reversed the widespread urban and agricultural destruction of wetlands or freed rivers from the concrete and rock that straightened their course. A new environmentalism is needed that can redirect and reconcile human activities to better support and even expand habitat for native species. Rather than insist on blocking human use to protect nature – a largely quixotic quest now – environmental reconciliation works in and with unavoidably human habitats. A vivid example of this integration is the planned rejuvenation of the Los Angeles River. Deadly floods in the 1930s led the U.S. Army Corps of Engineers to straighten and pave nearly all 52 miles of the river channel in concrete. In recent years, however, a grassroots campaign to transform the giant, trash-strewn storm drain into something resembling a river has gained political traction. Illustrations in the city’s river revitalization plan show a natural and human-made hybrid. Flood protection would be maintained, but tons of concrete would be replaced with terraced tree-lined banks and wetlands that link bikeways, parks and neighborhoods. The goal is not so much to restore the river but to reintroduce nature to residents of a harshly unnatural environment. 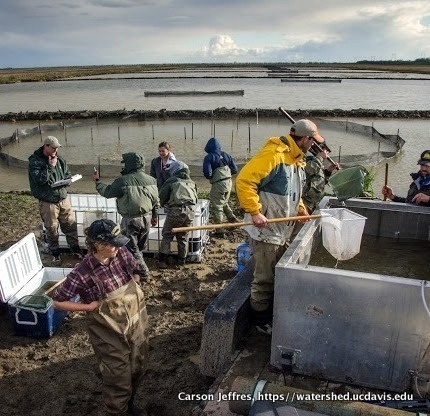 More recently, in the Sacramento Valley, a consortium of private landowners, conservation groups, government agencies and researchers with the UC Davis Center for Watershed Sciences is working to help struggling salmon populations in mutually beneficial ways. Environmentalism with the more positive and proactive direction of reconciliation has potential to create new habitat for native species, rather than maintaining unsustainable remnants on hospice at great expense. New environmentalism is about diverse interests working together to create more promising environmental solutions. In contrast, the politics and finance of classical environmentalism often require casting others as villains. Some environmental assaults demand a call to arms. But the public has grown weary of confrontation and standoff, such as the decades of stalemate over the Delta. The resulting inaction has cost both the environment and the economy. Earthquakes, floods, and sea level rise will act to transform parts of the Delta into open water – risking water supplies for millions of acres of farmland and millions of Southern Californians. So far, governing institutions have been unable to lead in responding to inevitable environmental change. Classical environmental thinking pervades environmental regulation often to the point of impeding environmental progress. Regulatory agencies cannot agree on environmentally beneficial changes unless proposals are almost entirely without negative environmental impacts, often perpetuating an environmentally inferior status quo. As most ecologists and even politicians now recognize, nature and human activities cannot be kept strictly apart. They must largely be reconciled and even integrated. To be sure, some habitat should remain off-limits. But classical environmentalism alone can only lead to increasingly expensive environmental decline and public derision. Jay R. Lund is a UC Davis professor of environmental engineering and director of the university’s Center for Watershed Sciences. This commentary originally appeared in The Sacramento Bee on June 30. This entry was posted in Uncategorized and tagged California water, environmentalism, Jay Lund. Bookmark the permalink.